I'll admit it, I am not a huge fan of commercial campgrounds. 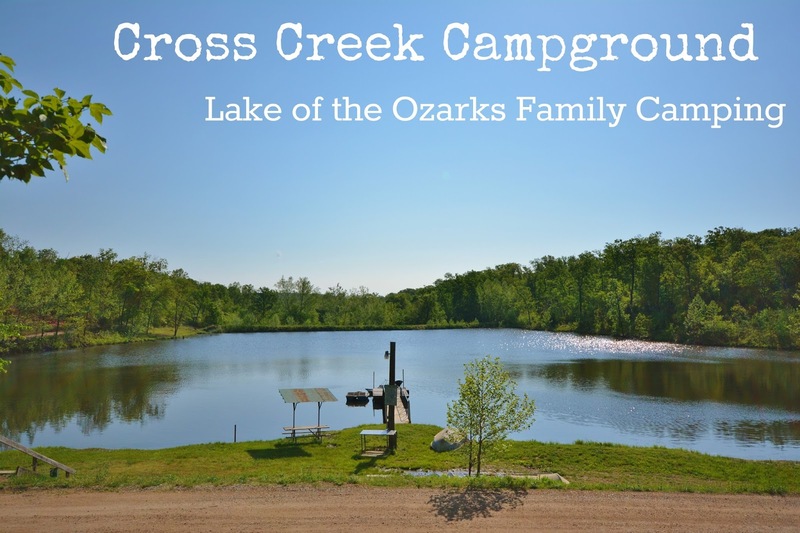 The boys and I tend to stick to State or National park campgrounds when we travel, but when the CVB put me up at Cross Creek Campground in Lake of the Ozarks, it really won me over. Perched back on a gravel road, the sites overlook a lake that just begs for fishing, and seems to sparkle with the light of a thousand diamonds when the sunlight hits it just right. Teaming with fun-filled activities for the whole family, Cross Creek Campground is an ideal spot for camping in the heart of Lake of the Ozarks. There are a wide range of campsites available at Cross Creek Campground, from grassy tent sites to lakefront RV sites and even a secluded site on your own personal private island. RV sites come with full hookups, and all sites come with a picnic table and fire pit. This campground is no asphalt parking lot, and because of its location, it is quiet at night with nothing but the sounds of nature filling the air at night. If full out camping just isn't your thing, the campground also offers Tree House Cabins that offer the luxuries of home in the great outdoors, these are adorable, and a great alternative to a pricey hotel room. Unlike some State and National Park campgrounds we have encountered, showers at Cross Creek Campground are free, as is the WIFI. A laundry room is available, and wood as well as other small sundry items are sold at the main office. Activities is where Cross Creek Campground really shines. They have a variety of activities both on and off season. The miniature golf course is a neat feature that I don't believe I have ever come across at a campground before, there is also volleyball and basketball courts, a playground set back in a wooded haven, and a game room. During peak season, you can enjoy swimming in the pool, and paddle boats. Of course, fishing is always a popular activity here with the 8-acre lake and fishing licenses are not required. If you know me, you know that customer service is big in my book. In fact, it can make or break a location for me. Luckily, customer service is top notch at Cross Creek Campground. Hosts John and Wendy Peters are incredibly helpful and provide service with a smile. Rates for tent camping start at $25 on weekdays and RV sites start at just $30 on weekdays with full hookups. For full pricing and accommodation information, visit the Cross Creek Campground. Planning a trip to Lake of the Ozarks and looking for a place to camp? Cross Creek Campground offers great quality year-round accommodations that are sure to make your vacation experience a pleasant one. Wow! This campground looks amazing, I've wanted to visit the Ozarks for a long time this would be the perfect place to stay! They have free showers, free WiFi, AND laundry? What a great find! Looks like an amazing place to camp out and it's amazing that it has free wifi! This looks like beautiful place to stay. Staying at a commercial campground would be a must for me, so I appreciate your reviews on a few. This one seems to have a ton of amenities!